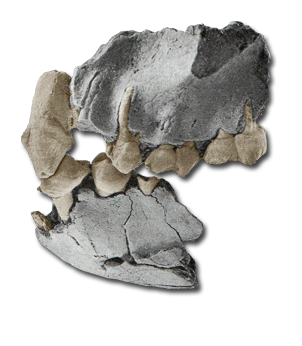 Kenyapithecus is identified by dental and humeral remains and is considered to have been a large and sexually dimorphic ape. Dental remains, robust jaws and thickly enameled molars, exhibit morphologies consistent with powerful and prolonged masticatory abilities (Jones, et al.). 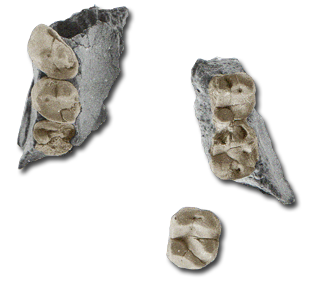 According to Hartwig, “The maxillary canines show deep mesial groove development and pronounced fossa while those of the males are much more robust overall than the females and have tall and inflated crowns. Both the M1 and M2 have four primary cusps with minimal crenulations with the M2 being longer and broader. The mandibular canines have tall crowns and minimal crenulations. 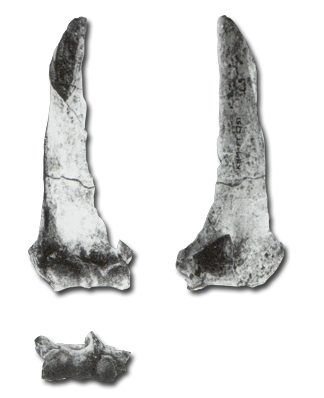 Mandibular molars are poorly preserved and show a lack of significant buccal cingulum development.” The recovered postcranials are few and suggest relatively little difference in habitat and lifestyle than Proconsul (Jones, et al. ).